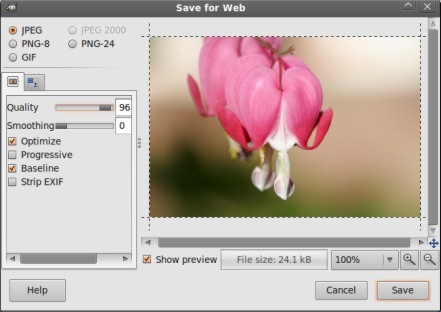 The aim of this post is to explain you how to install gimp save for web plugin on ubuntu 9.04/9.10/10.04/10.10.After reading this post you can easily optimize or compress images in different formats – jpg,png and gif by using GIMP(GNU Image Manipulation Program).GIMP is the most popular open source and free image editor;used by common users as well as by web developers.Due to exponential increase of web it’s necessary(not always) to optimize images for less bandwidth consumption and faster page load(This factor is very important if you are a blogger or web developer). #1. I assume that,you have already installed gimp on your ubuntu.If this is not the case then first install gimp(if you don’t know how to install gimp,then go through the link given below and come back again here). #2. Then Open Synaptic package manager and search for ‘gimp plugin registry’ then select the package by checking the box.This package contains extra plugins for gimp along with the save for web plugin. #3. Then click on Apply to install it..wait until the installation is complete. #4. Now, open any images with gimp and click on File->Save for Web;then choose the o/p file type(extension i.e jpg(Recommended for natural && photographic images),png(animation or computer generated images) or gif),quality-size settings(adjust according to your need,85 is default for jpg,you may increase it little but keep it less than 95),crop the images…after that save it. #5. End of the FUN!! Previous Posthow to install calibre on ubuntuNext PostLinux Kernel v2.4.37.10 released! Thanks for these steps to install “save for web” in GIMP. It helped a lot !! WOW. I tried to install this damn plugin through GIMP’s registry manually and got an error. Thanks for this tip. Saved me some headaches. the larger image with approximately same quality.Thanks for sharing nice post.